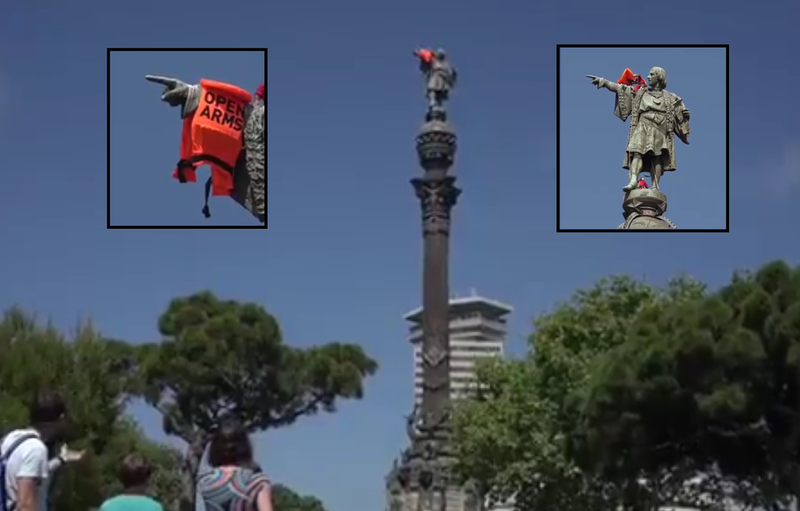 In great similarity with what happened in New York this week, where a Congolese immigrant climbed the Statue of Liberty to protest US President Donald Trump’s stance on illegal immigration, a group of protesters scaled the Columbus statue in Barcelona, Spain to unveil a giant life jacket stating ‘open arms’ in protest to the hardening of Europe’s stance in matters of migration. It comes as another NGO ship arrived in the port of Barcelona with 60 migrants rescued off the Libyan coast on board. Both Italy and Malta had earlier refused them entry. According to Ms. Anabel Montes, who works for the NGO Proactiva Open Arms, the migrants, mostly from middle Africa, are "are doing well given the circumstances, there was no serious medical emergency and they're happy because we told them the government wanted them to come here." The news comes two weeks after another NGO rescue vessel, carrying some 630 migrants, was finally authorized to dock in the port of Valencia after having spent a week at sea. EU leaders are hardening their stance on migration to the 28-member state bloc, certainly now that Austria has taken over the rotating presidency. Austrian PM Sebastian Kurz had earlier this week threatened to close the Austrian-German border if German Chancellor Angela Merkel implemented her plan to set up control stations at the German border and return any migrant already registered at another EU member state. Many rightwing leaders in Europe have accused charities in the last few weeks of playing into the hands of people smugglers with their missions rescuing migrants off the coast of Libya. According to Italian Interior Minister Mr. Matteo Salvini, the NGOs had simply set up a ‘shuttle service’ between Northern Africa and Europe in doing so. "… US President Donald Trump’s stance on illegal immigration…"
" 71% of America's stance on illegal immigration…"
give the savages two choices.. GET OUT OR DIE!